Two years ago I was trying to figure out what was next in my life. Do I start my own firm, work at a different company, or go back to school. 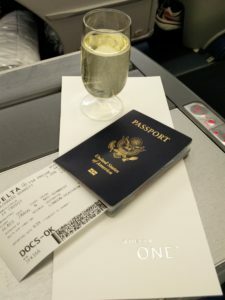 I was facing a rough patch but a few months earlier had booked a flight to Italy to stay with someone who I’d met only once before at an airport lounge on New Years. It was an incredibly crazy thing to do and I am so glad I did it. I spent the week before Christmas experiencing the European lifestyle and just decompressing from the stress of it all. It was in Italy, just after leaving the colosseum that I got a job offer and also decided to apply to get my MBA. That trip helped inspire me to choose Oxford when the time came. This past Easter I was invited back down and as I started to prep for a handful of exams it was exactly what I needed. A rooftop with sunlight, a view of the harbor, and some prosecco with friends. It reaffirmed the decisions I’d made and helped me start to see ways of living that I want to incorporate into my life in the future. From being truly a local in the community to being the life and host of a party. Having finished up my MBA this weekend I have felt a bitter-sweetness as the amazing year comes to an end. And so to combat this I booked a flight down to Italy again and am just a few hours from landing in Napoli where I’ll have amazing food, great friends, and a chance to decompress from it all. Something about these people, this place, and the pasta is truly amazing. I am looking forward to a weekend of rest & relaxation that will recharge me for whatever comes next, be it a job in the UK or back in the states. Italy has become my happy place and I’m so happy to be back. 1 year ago today I landed in the UK. I’d spent my flight flirting with the flight attendant who I eventually went on a few dates with. I cleared customs and hopped into a cab I’d had waiting for me to take me to Oxford. I walked up to Lincoln college, grabbed my keys and dropped my bags while I made 3 trips to collect all of my stuff because the street was closed for a fair and the cab couldn’t make it through. Exhausted I unpacked my things and went out in search of carbs. I’d seen a place called Mission Burrito a shop that promised San Francisco-style burritos. FALSE! These tasted nothing like even the lowest of Tex-Mex in the states known as Chipotle. It was terrible. I moved into my flat and settled in for a year of classes, new people, and (although I didn’t know it yet) absurdity. The past year has been one of the best I’ve had as I’v enforced the time to grow individually as I discover myself. I’ve also spent the time I needed learning the previously foreign language of Business that seemed to be all around me at my old job. I spent today showing my parents inside colleges and various bits of life in Oxford. We met the children of great men, saw the colleges that inspire literary generations, and experienced the Oxford I’d lived in for the past year. I am so grateful for the year I’ve had and hope that I am able to keep the lessons I learned (both in and out of class) in my heart as we bid farewell to the town we will always call home, Oxford. Author David B BakerPosted on September 9, 2016 Categories Daily Dose of David1 Comment on The Change of a Year. Author David B BakerPosted on September 8, 2016 September 8, 2016 Categories Daily Dose of DavidLeave a comment on Gratitude? It was a wedding to aspire to. Set against a European backdrop that was “home” and surrounded by family, friends, and loved ones the bride and groom were beautiful. The ceremony included groomsmen in full morning coats – tails and top-hats – and bridesmaids from multiple countries as their courtship spanned great distances. This wedding was my first full taste of what Oxford SBS looked like as it was one of my best friends, her father calls us brother and sister, who was marrying a graduate of Oxford SBS class of 2012. I attended their wedding and was blown away by the experience. For context, the wedding was literally featured in Brides magazine a few months later. But what blew me away were the people. The SBS classmates who had come from all over the globe to see their friend get married and to party and celebrate with him. I met a dozen students that October evening and chatted with them about the program and their experience. It was at that wedding that I bumped Oxford from low on my list of schools to the top. The inclusiveness and camaraderie that the class exuded was on full display and I was smitten by it. More so than from any other MBA program. A wedding helped me make up my mind in favor of Oxford and as we head into graduation week I got the chance to participate in a wedding for two of my best friends in the program who got married yesterday inside the great cathedral of Christ Church College. I’ve had the pleasure of attending services with them there for most of the year. Saving each other seats when one or all of us are running late and brunching afterwards as we discuss the sermon. The church helped bind our friendship together more than the committees we sat on or the classes we had together. It allowed us to spend time and space away from school without leaving it and that helped us grow closer. Their wedding was again outstanding. Groomsman in morning coats and bridesmaids from multiple countries. Guests from 6 continents and more than a dozen languages spoken just int he wedding party alone. The ceremony was held in the cathedral and the reception in the gorgeous town hall just next door. With guest dancing until after 4 am I’d say it was an amazing way to start the end of my time at Oxford and a great matching bookend to the wedding that brought me here in the first place. What struck me most about the wedding personally was how that same camaraderie existed between strangers united in the common purpose of supporting their union at both weddings. I have never been one to plan out my big day and think about color schemes and outfits, and the like. I may have protested outside the Supreme Court for my right to get married but the wedding itself hasn’t held a major interest to me. But after last night, I know that beyond the venue, beyond the cake, beyond the outfits I will only care about bringing that same spirit of unity into my wedding. Everything else is negotiable but I want to have that feeling with me and I hope many of the guests from last night will be able to join me on that day.